Invisalign is the virtually invisible and hygienic alternative to braces that lets you keep smiling during your treatment. Invisalign uses a series of custom-made, clear, removable aligners that gradually move teeth toward the smile you've always wanted. Invisalign is so discreet; most people won't even notice you're wearing them. 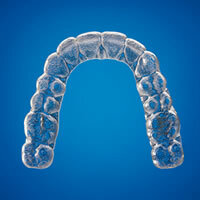 Invisalign aligners are suitable for both adults and teenagers. 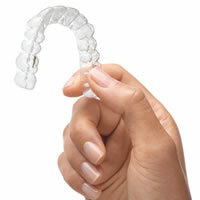 Invisalign is nearly invisible - you can straighten your teeth without anyone knowing. Invisalign is removable - you can eat and drink what you want in treatment; you can also brush and floss normally to maintain good oral hygiene. Invisalign is comfortable - there are no metal brackets or wires to cause mouth irritation: no metal or wires also means you spend less time in the doctor's chair getting adjustments. Invisalign allows you to view your own virtual treatment plan before you start - so you can see how your straight teeth will look when your treatment is complete. Invisalign uses 3-D computer imaging technology to depict the complete treatment plan from the initial position to the final desired position from which a series of custom-made "aligners" are produced. Each aligner moves teeth incrementally and is worn for about two weeks, then replaced by the next in the series until the final desired position is achieved. Aligners are nearly invisible and look similar to clear tooth-whitening trays, but are custom-made for a better fit to move teeth. Some orthodontists have referred to them as "contact lenses for teeth". The length of treatment is dependent on the severity of each individual patient's orthodontic issues. Treatment may vary from anywhere between six months to two years with an average treatment taking around 12 to 14 months. To find out if you are suitable for Invisalign treatment, make an appointment with one of our orthodontists. You can also visit the Invisalign website for more information.